When Leila Kalomi asks Spock for his first name in TOS: "This Side of Paradise", Spock replies that she couldn't pronounce it. This implies that Spock has a first name. On the other hand, every other time without a single exception when Vulcans are mentioned, they are only referred to with a single name, no matter whether in a formal or a familiar address. Is Spock lying? It seems so. First of all, since he is the son of Sarek, grandson of Skon and great-grandson of Solkar, "Spock" must obviously be his first name. But maybe he just didn't bother to explain the whole system of Vulcan names. Also, there may still be a second name, which happens to be hard to pronounce. Considering that his mother Amanda is human, he might have a human first or second name too, against Vulcan tradition. But wouldn't it be paradoxical that this name should be too hard to pronounce for a human? If he has a another Vulcan first name though, why would Vulcans be given such names that are complicated and extremely seldom used, quite unlike their main names? Maybe it's some sort of "secret name" which may not be spoken out to keep away misfortune. This, however, wouldn't be logical at all. At least Romulans have first and last names, as evidenced by Admiral Alidar Jarok (TNG: "The Defector") and Senator Kimara Cretak whose full name was mentioned in DS9: "Inter Arma Enim Silent Leges". Apparently, even Amanda cannot pronounce it correctly, and never tries in public (At least not on-screen). Possibly, the family names are untranslatable into English, and unpronounceable by humans. Mispronunciation of the name may even be considered an insult by the Romulans, and in very bad taste to the Vulcans (who, of course, cannot be insulted ;-))"
This suggestion is by Alex: "Perhaps first names are something only reserved for your mate and parents. I suggest this using evidence from 'The Enterprise Incident' from The Original Series, when the Romulan Commander evidently wanted to keep her name a secret, and pretty much only shared it with Spock. Since Spock didn¹t seem to think this behavior was odd, it may be surmised that Vulcans have a similar 'ritual' (for lack of a better word) concerning first names." Finally, there is a funny anecdote by Shik: "In 1986, I was 11 years old, and my mother was speaking at a scuba conference in Boston. That same weekend also happened to be the date of a Creation 20th-anniversary Trek Con one hotel, so having never experienced one, my parents decided to take me. During the con, we happened to stumble into a hall where Jane Wyatt was giving a lecture/appearance; it was now in the Q&A period. A few minutes after walking in, some wag got up to ask his question & said to Ms. Wyatt point-blank, "OK....if you're Spock's mother, you should be able to tell us the answer -- what IS Spock's first name?" Ms. Wyatt took a 2-second beat, looked right at him, and said pointedly, 'Harold.'" While human names in Star Trek are predominantly of British or Irish origin, aliens very often have names of seemingly Terran origin. As a matter of fact, almost all alien names are more familiar and much easier to pronounce to the TV audience in Western countries than human names of East Asian origin, for instance. Many similarities of European human and alien names may be accidental, but some of them are just too blatant, like "Martus Mazur" (El-Aurian), "Kyril Finn" (Rutian "Irish" terrorist), or even "Abrom" and "Isak" from Zeon (Zion?). Most notably, however, Greek and Roman sounding names are exceedingly popular in our galaxy. There are countless alien women with first names ending on "-a", such as Alcia, Tressa (Drayan), Alixia, Talaxia (Talaxian), Anya, Salia (alassomorphs), Ariana (Tarellian), Deanna, Kestra (Betazoid), Danara (Vidiian), Deela (Scalosian), Gia (Barkonian), Ilia (Deltan), Irina (Delta Quadrant race), Kamala (Kriosian), Kara (Eymorg), Karya (Vori), Lenara (Trill), Martia (chameloid), Melora (Elaysian), Natira (Fabrini), Nimira (Mari), Nona (Tyree's planet), Odona (Gideon). And these are only very few random examples. Actually, the vast majority of alien female names ends on "-a", which is a totally incredible oddity. In some cases we may assume that aliens deliberately introduce themselves with names that are familiar and easy to pronounce for English-speaking humans. But it is obvious that such an explanation is not possible for aliens, which are encountered for the first time or who are proud of their heritage and wouldn't distort their names. Much less does it seem likely that the universal translator could be programmed or could and should have the creativity to filter out strange sounds and give alien women arbitrary names ending on "-a". Moreover, that would make Chinese names sound more "alien" to English-speaking humans than any alien name. Tyree: planet native in TOS: "A Private Little War" & planet where Sisko finds the Orb of the Emissary in DS9: "Image in the Sand"
Rahm Izad: star system mentioned in TNG: "The Chase" - Ram Izad: civilization eradicated by Annorax in VOY: "Year of Hell"
Tholians: hostile race from TOS: "The Tholian Web" - Tolian Soran: El-Aurian scientist from "Star Trek: Generations"
Haakona: Romulan Warbird in TNG: "Contagion" - Haakonians: enemies of the Talaxians in VOY: "Jetrel"
Devoras (Latin: "you swallow"): Romulan Warbird in TNG: "Data's Day" - Devore: Delta Quadrant Civilization in VOY: "Counterpoint"
Garaner: civilization in VOY: "Macrocosm" - Garenor: civilization eradicated by Annorax in VOY: "Year of Hell"
Antarian: Antares by far is the most popular constellation in the Star Trek Universe. While the Antarians seen in ENT: "The Breach" may be the named for this star system (although it is unlikely that they come from there, hundreds of light years away from Earth), there is no way to explain why there had to be "Antarians" in the Delta Quadrant too (VOY: "Drive"). Quarren: Kyrian museum director in VOY: "Living Witness" and & species from the planet Quarra in VOY: "Workforce"
Tarchannen: planet on which Geordi almost mutated to a strange creature in TNG: "Identity Crisis" - Tarkannen: civilization with which Chakotay made first contact, mentioned in VOY: "Innocence"
Finally, there are the countless other T-Races of which many are absolutely homonymous, although they evidently can't be the same. The search for the meaning of Darmok in TNG: "Darmok" yields dozens of results, which is not astonishing considering that thousands of civilizations have developed millions words and names many of which are likely to be similar or even the same. Yet, the above coincidences are too numerous and seem to be too prominent. One of them has a real-world explanation: Gene Roddenberry apparently tried to find a missing war comrade by naming Noonien Singh/Soong for him. There are limits to the capabilities of the replicator. If the replicator works on a molecular basis as mentioned in TNG and suggested in the TNGTM, it is only possible to create chemical compounds, not any desired elements (which would be equivalent to nuclear fission or fusion on a miraculously small scale). So any materials that are both seldom in nature and hard or impossible to replicate would still be precious in the 24th century. Gold is still valuable, as we learn on several occasions. The Ferengi steal the golden comm badge from Riker and call gold a "valuable metal" in TNG: "The Last Outpost". In TNG: "The Price", the Ferengi bid gold bars on top of everyone else's offer to gain control of the Barzan Wormhole. The Ferengi Sovak offers Vash's weight in gold in exchange for the disk in TNG: "Captain's Holiday". 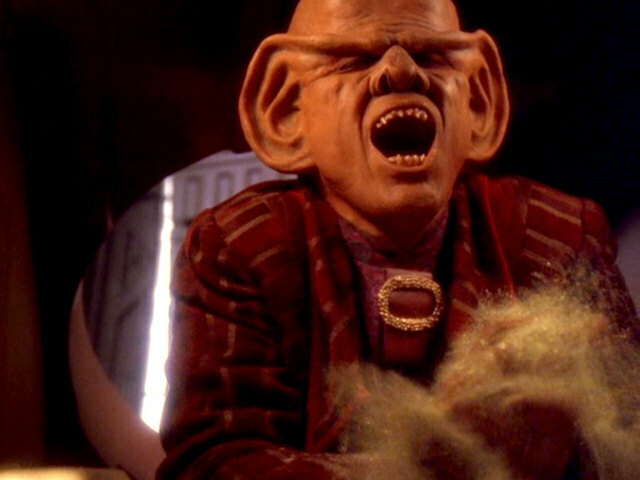 When he proposes a deal to the 20th century Americans in DS9: "Little Green Men", Quark agrees to be paid in gold. When Morn is presumed dead in "Who Mourns for Morn? ", however, Quark is deeply disappointed to find only the worthless gold instead of the expected gold-pressed latinum in Morn's bequest. Valuable gold in TNG: "The Price"
Worthless gold in DS9: "Who Mourns for Morn?" Either the value of gold is subject to significant fluctuations in the 24th century, or Quark intended to stay in the 20th century in "Little Green Men" when gold was still precious. This still doesn't explain why the Ferengi in "The Last Outpost", "The Price" and "Captain's Holiday" think gold is valuable, however. Considering how greedy Quark is (supposed to be), maybe latinum is so much more valuable than gold that Quark just couldn't come to appreciate that he had at least the gold in "Who Mourns for Morn". The first explicit mention of baseball in Star Trek is in TNG: "The Big Good-Bye" when the historian Whalen explains it to Data as "a national obsession at that time" (the mid-20th century), thereby implying that the sport will have lost its popularity until the 24th century. This remark, especially since it comes from a historian, is very Americentric (as if there were still nation states in the 24th century and as if it would matter a lot more what is or was going on in the USA than on the rest of the planet), but this is still another problem. Anyway, the baseball story continues in TNG: "Evolution" when Paul Stubbs talks to Wesley. When asked whether he knows baseball, Wesley replies, "My dad taught it to me when I was little." Stubbs moans, "Once, centuries ago, it was the beloved national pastime of the	Americas, Wesley. Abandoned by a society that prized fast food and faster games. Lost to impatience. But I have seen the great players make the great plays." This clearly indicates that baseball is not popular any longer. But how is it possible that Kivas Fajo, the ruthless alien trader, shows an obsession with baseball when he proudly shows to Data, besides some things of little value like a Dali painting, a baseball card from the 20th century? Since he only collects things that are rare and precious, this should apply to the old baseball card too, and why should the card be valuable if no one is interested in baseball any more and wouldn't possibly even remotely know what it was? The development baseball takes in DS9 is strange. In accordance with Whalen's and Stubbs's statements, Nog says in DS9: "The Storyteller": "It's a stupid game that even hew-mons stopped playing hundreds of years ago." Captain Sisko considers himself as the only baseball fan left, and in DS9: "If Wishes Were Horses" he complains that baseball ended when only 300 spectators attended the last game of the World Series in 2042. Jake Sisko, like Wesley, has no idea of baseball until his father shows him. Sisko is pleasantly surprised when Kasidy tells him that settlers on Cestus III have formed a new league, obviously the only one in the Federation. In DS9: "In the Cards", however, an old baseball card is again something of great value, not only to Jake who wants to purchase it for his father. It is already paradoxical that the sport is first declared dead in DS9, only to play a major role throughout the series which culminates in DS9: "Take Me Out to the Holosuite", a whole episode about a baseball match. But aside from that, how does the fact that baseball is a forgotten sport go along with the fact that Paul Stubbs, Ben Sisko and maybe Jake Crusher are avid fans and that baseball cards, quite unlike the real thing, are very popular? Even if there is no professional league, there may be still school teams, as well as fans who are interested in the game without actively playing it. But in this case, there would be no reason why people shouldn't play it, even and especially if just for fun - since we can assume that in a Federation sport league money would play a minor role. It is possible that Ben Sisko exaggerated a bit when he assumed no one was playing baseball any longer, but it was made quite clear that on Cestus III baseball has just started again, after a long hiatus on Earth. But even if we can make out reasons for baseball having lost its popularity, the immense value of the cards remains a total mystery. Romulan ale is illegal in the Federation in the 23rd century. Yet, McCoy frequently drinks it, as seen in "Star Trek II". Somehow Kirk got his hands on a supply of this beverage for the banquet with the Klingons in "Star Trek VI". He noted that this was "one of the advantages of being a thousand light-years from Federation Headquarters." It is not certain whether the ban on Romulan ale was rather meant as a trade embargo in the first place, or if it was because of the intoxicating effect of the beverage. Anyway, some time during the Dominion War the ban was lifted, and Romulan ale was officially served aboard the USS Bellerophon in DS9: "Inter Arma Enim Silent Leges". Yet, roughly two years later during Riker's and Troi's wedding in "Star Trek Nemesis" Worf is suffering from its effect and complains, "Romulan ale should be illegal," whereupon Geordi says "It is." So was the ban reinstated? It seems more likely that the ban was imposed on Romulan ale as a rather symbolic trade embargo -- like the one on Cuban cigars in the USA. In any case it doesn't seem to make sense that the ban was lifted for only two years. Maybe we should take Geordi's statement with a grain of salt, as there would be no sense in still maintaining the embargo, and we would be left withat least one occurrence less where the beverage was served against regulations. The alcoholic beverage appears for the first time in TNG: "The Wounded" when it is served to a Cardassian officer in Ten Forward. Here kanar is a clear liquid in small glass jiggers. 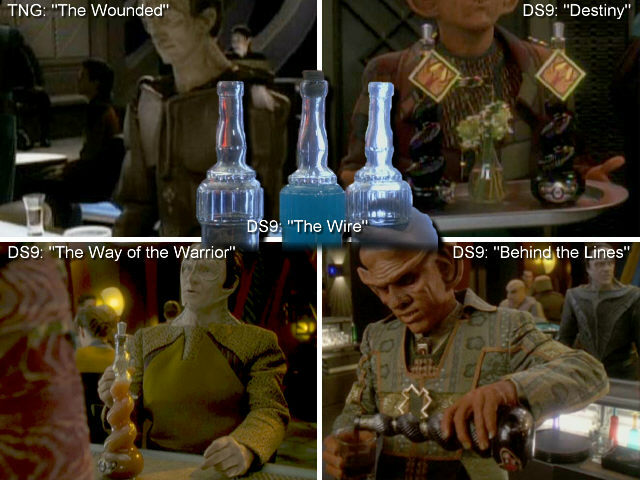 During DS9, however, kanar is always a more or less opaque syrup-like beverage. It is dark brown on various occasions ("The Maquis", "Destiny", "Behind the Lines") and most often served in rather large whisky glasses, usually from the characteristic spiral bottles. 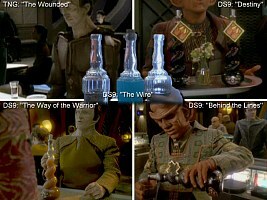 In DS9: "The Way of the Warrior" the beverage is more like orange whereas it is opaque blue in DS9: "The Wire". There are definitely different varieties of kanar that come in different bottles and have different colors. Yet, we wouldn't expect the types of kanar to be so diverse that one is a distilled drink like whisky, whereas another one is a liqueur. Kanar may be a Cardassian collective name for any liquor, but then we would expect them to specify more precisely what they are going to drink. Considering the wide variety of alcoholic beverages on Earth and the fine distinctions like between blended and single-malt the Cardassians don't seem to care all that much about what exactly they are drinking. It is also possible that in "The Wounded" the Cardassians were just polite and didn't complain about the poorly replicated kanar they were being served. Kang states, "We have no devil, Kirk, but we understand the habits of yours." in TOS: "Day of the Dove". 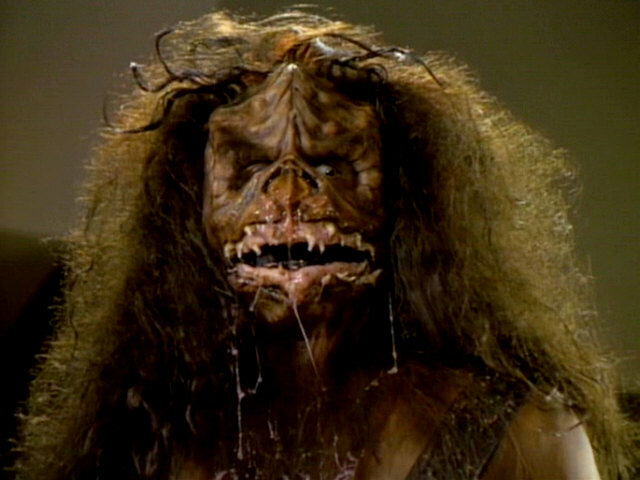 Contrary to that, a character from Klingon mythology, namely Fek'lhr, is shown in TNG: "Devil's Due" and explicitly referred to as Klingon version of the devil by Worf. Fek'lhr in TNG: "Devil's Due"
Personally I never saw this as particularly inconsistent although it is made a big deal elsewhere. It's frequently asked and shows up in virtually any fan-made list of Star Trek inconsistencies, so I was urged to comment on it. If there were supposed to be more than one Klingon race and culture, we could neglect the question as a side aspect of the much more severe Klingon forehead problem. But if we go with the Star Trek authors and assume a rather monolithic culture, the problem remains. Maybe Kang did not realize the parallel between Fek'lhr and the Devil, or he intentionally remained silent about it. Alternatively, a change in the Klingon society and religion could have well resurrected this long-forgotten mythological figure. But ultimately, Fek'lhr may not really be the equivalent to the devil. Like the guardian of Gre'thor, a rough equivalent to the Christian concept of Hell (VOY: "Barge of the Dead"), Fek'lhr is not necessarily the impersonation of evil, but could be just an unfortunate soul that has to perform this duty. Just as Kortar, who is in command of the "Barge of the Dead" to Gre'thor. David Osborne suggests: "...it was established in the DS9 episode "Homefront" that the Klingons killed their gods a millennium ago. I find it not inconceivable that the character Fek'lhr was indeed the devil in Klingon mythology up until this time, but that he was simply one of the casualties of the culture shift that overthrew the rest of the Pantheon. Thus, there is no devil for Kang,but "Ardra" would be able to find the Klingon equivalent anyway. The Encyclopedia notes that Worf was not impressed with 'Ardra''s display: This is consistent, as Fek'lhr was supposed to be dead." All Borg used to say "few-tile" until Seven of Nine who pronounces it as "few-tul". Who is correct? Jeri Ryan: "Good question. When my character was introduced I had to say, 'Resistance is futile.' The producers had shown me the movie First Contact so I'd at least know what a Borg is, and every time a Borg speaks the line it's 'Resistance is few-tile.' Few-tile, few-tile, few-file. So I asked your question: 'Few-tile? Is that a Borg thing? Or is it few-tul?' They said, 'No, no, no, it's few-tul. You don't say few-tile. Patrick Stewart says few-tile because he has an English accent.' I said, 'Well, what about the voice of the Collective? It says few-tile, doesn't it?' ... 'No, no, no. We recorded the voice of the Collective and it says few-tul.' I said, 'All right, but I don't want to take the flak if we start getting mail because I said the wrong thing.' Sure enough, the show airs and the voice of the Collective says few-tile, and I'm the only Borg in the history of Star Trek, apparently, who has ever said few-tul. It has no zip. It's depressing." Actually, Data says "few-tul" too in "Star Trek: First Contact" (when he smashes the coolant tube, thereby killing the Borg). Which appears strange because Jeri Ryan should have noticed that, saying that she watched the movie. Perhaps she only saw the introduction of the Borg in the beginning. And after all, she explicitly referred to the Borg always saying "few-tile", not to Data. Some screen caps from TrekCore and Jörg Hillebrand. Thanks to Jeffrey Griffin and to Lin for several suggestions, to Andy for correcting facts about the history of baseball and to Mathew Thompson for reminding me of Data's pronunciation of "futile".